Tax Sale Info-Marathon, November 15th-16th - 24 hours straight! You've reached the official submission area for the DeedGrabber Marathon Suggestion Contest! 1. 26.2 hours of me LIVE – and I will take the time to speak to YOU. 2. Over much of the 26.2 hours I will have nothing else to do but give away all of my best material. I will hold nothing back. 3. Live guests including successful students and my staff – ask them your toughest questions! What else should I include? Reply with a comment below! 4th-10th Place: Free admission to the Marathon! Can't wait to see what you guys will come up with! Tom, I’d be happy to do that for you. I bet if you got on late at night or early in the morning, I’d be all yours. Reveal your best kept secrets of how to find investors and buyers! Thank you, it makes us feel so good to hear this from you. Keep a good attitude like Bobby, keep going at it, and we’ll be here to help all we can. I am totally broke, scratching for food at this point. What I have is a computer, time and lots and lots of enthusiasm. Is there a funding source to get money to go to the courthouse steps and buy property? There is plenty you can do with a computer, time, and enthusiasm. Just don’t go to the courthouse steps and buy property!! That’s not how you do it unless you have a lot of money and knowledge. I’d like to hear the top 10 or 5 ways you overcome objections as a Deedgrabber when approaching property owners. Very interesting question Jeff. I was thinking about this just today. You know what? I thought about almost every deal I’ve done, and the circumstances just didn’t lead to many objections. The seller needs to WANT to do the deal with you and may have some questions which you answer honestly. Then they decide whether the deal is right for them or not. I point out the obvious and let them reach their own conclusions. I really don’t try to talk anyone into anything. We’ll have Michelle on the line quite a bit, she has done almost all of my initial “cold/warm” calling, maybe she’ll have more to say. I’d like to know which states make it the easiest to obtain overages, exactly what you say on your scripts, what docs you send to clients, and how do you get around the limited percentages allowed for an assignee? Good ones! We’ll cover all that. Briefly: There is no easiest or hardest state, you just have to know how to give the county what they want to pay the claim. We’ll talk about scripts (it’s really only a handful of lines). On your last question, we get around finder fee limits by collecting funds that aren’t subject to finder fee limits. Or, by getting the assignment, we BUY the claim, so we’re not earning a fee of any kind. You Are The Man With The Plan Stan! “I HAVE A DREAM” “I HAVE A DREAM” !! What doe’s “we will be giving away 10 FREE SPOTS on the marathon call” mean ? Is the “Marathon” a webinar or through a regular phone line ? Rick some of us are ONLY interested in Overages and more specifically ‘The World Of ClaimGrabbing’ . Tear it up and put it back together for us . I’d like to hear your take on how far this niche can realistically be taken . You mention 5 figure MONTHLY checks . In your opinion , is the ability to earn those same checks on a WEEKLY basis realistic ? Can ClaimGrabbing COMPLETELY replace ‘finders fees’ ? When working strictly on ClaimGrabbing , on average how many hours ‘per case’ would you say someone works that individual case ? 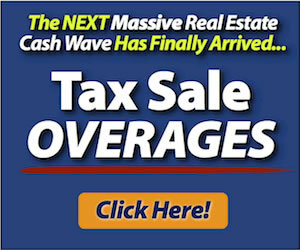 Please give a tax sale and mortgage sale example . Another fellow , who mentions you as ‘competition’ by name , also sells a course with a similar ‘theme’ as your “ClaimGrabber Course” . I was wondering if you have bought his course and if so what is your opinion of it . His name is Shawn Buige . Shawn seems unable to do his own marketing, and attempts to ride out coattails everywhere! I don’t know him or his course. By the way, I don’t “compete” with anyone. There’s plenty for everyone out there. Don’t have a scarcity mindset, it will almost certainly stop you from being successful. Regarding ‘the buying of claims’ , what percentage of claimants and lienholders THAT YOU CONTACT do or don’t do business with you and what is reason ? Can you speak about THE most successful ‘ClaimGrabber’ you know ? Are State held funds THE largest pools of surplus foreclosure funds and can they be worked using your ‘ClaimGrabber’ course ? State held funds are mostly not foreclosure surplus funds. They are miscellaneous funds like stocks, bank accounts, etc. The amount of state-held funds dwarfs the foreclosure surplus. Some states like Florida and Texas specifically limit Claimgrabber type collections on their state-held funds. Most don’t. However most states won’t pay out to you as assignee, you have to petition the court. Many states prohibit you from getting a list of their state unclaimed funds. And the claimants can find their funds online. I think you could get around all of those problems with a little creativity, except possibly the finder limits. Meaning the opportunity is probably wide-open. I’ve been too busy with everything else going on to make an effort there unless I’m following a tax sale surplus there. Who Closes a transaction when you are BUYING a Claim ? Attorney , Title Co. or Mobile Notary ? I don’t pay much cash upfront for claims. So I send a mobile notary out, and if necessary call an attorney to help collect. Since I’m not laying out much cash it’s not essential to have a bunch of research done upfront. What percentages of your business is ‘DeedGrabbing’ , ‘Finders Fees’ and ‘ClaimGrabbing’ ? And why ? I really don’t keep stats like that Roberto – too much other important stuff to do. In one sentence or less … how would you describe the “ClaimGrabber’ business to someone you where briefly talking to in an elevator ? It’s not a bad strategy – but you REALLY must be sure you’ll get paid. I personally don’t do it, I feel that the risk of laying out that much cash can’t properly be addressed. But I know one person in particular (not the guy you’re talking about I don’t think) who does well with it. hand hold the person like walking a baby,this is what many of us want and need. Giving material things are nice,but when your a knowledge junkie like myself it’s like offering an addict everything but when he or she loves and need. Just not enough hours in the day Abraham – I wish I could! That’s what this Marathon is for – there should be time for everyone to get a chance to talk about their situation. By the time you have this there will be no deeds to grab. No one will owe property taxes by then. Why don’t you find something else to talk about. Could save your bacon. Ken, what in heaven’s name are you talking about? Millions of properties will be tax delinquent then, as always. Easy! Don’t go to the sale! We’ll talk about it on the Marathon. Hi Rick! i’d like to see you IN ACTION, DOING A DEAL, OVER SKYPE IN REAL TIME OR a previously recorded LIVE DEAL over a webinar available for us to replay as necessary. Thanks!! That’s a great idea – not sure how I could make sure one got done though on that particular day! Anyone have a deal they’re working on that you’d like me to step in on? Tax sales in Indiana will be over by the 15th and I’ll be taking a break for a while. I would like to learn all about Deedgrabbing and how to make profits. What is the smallest amount of money to start this business? Technically, almost nothing. You could do free searches on the internet and use phone and email to contact people. And you could get a contract with them and just assign it to another investor for cash. Sounds like we’ll need to go over this in detail! How much does a person need to grab a deed ? will there be lots of other people trying to grab the same deed like at a auction ? Make sure to come to the marathon! You don’t need any money, I’ll show you how to find cash buyers and flip the contract to them. Don’t worry about the competition. I will be at the site you give tomorrow can’t wait to see how it’s done thanks. I have the deedgrabber and the hooked on overages. I would like to lesson to this marathon also. You’re in! Just follow the link on the email that’s going out today at 10am ET. OK, we’ll have a segment on that. I actually talk about the negatives of tax deeds all the time, but I assume you mean Deedgrabbing too. We’ll do that. Always in the past dosen’t mean forever. We are getting a new government within two weeks if all goes as planned. All bank debt, all IRS, property taxes,and all other monies owed to any government agency will no longer be owed. If you have money comming from them, they must pay you. Good times are comming. The paperwork is the key because once you locate a property and a ready and willing owner, you still have to unravel all the familial, and legal entanglements to make the deal fly, and to do that you need to be a document ninja. Since you have introduced me to Joe Kaiser, and Tactical Real Estate, I, like you several years ago, have made a 180 degree turn on where my focus is going to be from here on out. Thank God I didn't have to endure a hundred fix-and-flips to come to that realization. Now, this may sound tedious, but I would like to see a thorough document review – a complete CYA expose' so we can avoid lawsuits and threats of lawsuits – to be a certifiable hired gun. Then it would be great if you gave away copies of Gonzo Investing and Tactical Real Estate and any other books by Kaiser that you have in the warehouse. I looked far and wide for Gonzo Investing and couldn't find it. I did find "The Hunt For Abandoned Properties" by Joe Kaiser and it too is a rare find. This, I think, would provide exceptional value to your students. Gonzo is truly a game-changing book if you’re serious about making money in RE and not learning a bunch of lessons the hard way. Strategic and Tactical Real Estate Secrets is actually by Bryan Wittenmyer, and was also a book that changed my investing. If you read that book several times and really make an effort to understand it, you will truly know more about the technical aspects of real estate investing than most attorneys. I can’t tell you how many times I’ve had to explain concepts to real estate attorneys after mastering it. You can get that along with 2 other modules that are EXCELLENT, Perpetual Income and 525 Rehab Secrets at http://www.deedgrabber.com/strategic.html. Until you really understand real estate titles and paperwork, you overlook many deals that are sitting right in your lap. There are so many angles to attack a deal from, especially in a tax sale/foreclosure situation. One realization I got from reading Wittenmyer’s book is that real estate ownership (title) doesn’t have to perfect (far from it) to profit from a property. For instance, you can buy a house with $1,000,000,000 in liens against it, and if none of those lienholders are going to try to take it from you, who cares? Rent it out. Live in it. Whatever. Same thing if several people own a property and you can only get one to sign it over. After reading the book, I bought a 1/3 interest in a house (from 1 of 3 siblings, the others were dead), that had a $50,000 lien from the city for a forgivable fixup loan the mother had gotten 15 years ago, for $500 (because nobody else would touch it). Put $500 more into it and I’ve been renting it for $600 per month since 2003. While I still would never do a fix and flip rehab again, or have a mortgaged rental property, prices are becoming SO cheap in some areas, and rents are remaining high because nobody can buy, that you really might want to take a look at getting some free and clear houses cash flowing for you. I’m seeing wisely bought and spruced-up $10-$15,000 houses in my area renting for $600-$800 per month (though taxes can be devastatingly high and make some deals no good even if they were close to free!). Other areas I hear have lower taxes and people are seeing 18-24 month payback periods from the cash flow. Oh yea, great idea for concentrating on the paperwork. Perhaps you’d like to join me for a while on the Marathon and give everyone a few of your own aha moments. I’m afraid there’s no avoiding lawsuits, but there are things you can do to minimize them, and, at least in my experience, win them. Hi, I've been reading Maggie's writing about Rick Dawson's Hooked on Overages and also The Deed Grabber. I'm not familiar with "Claim Grabbing" mentioned here in comments section. Is that another course? I live in Illinois – "Tax Lien" state (vs Tax Deed state) & "Mortgage" State (vs. Deed of Trust state). Which would be a better course to take for Illinois (Tax Lien; Mortgage) state? For IL Mortgage Surplus do you have to be registered as Detective w/ IDPR? Tax surplus refund claim within 5 years in one county i read – is there similar statute of limitation with other states/counties? Which do you & others prefer better? Illinois doesn’t have tax sale surpluses, because they sell their liens for face value only and bid down their liens. Do they have mortgage foreclosure overages? I think so…. You asked a lot of good questions, and I think I gave you a lot of good answers…Illinois appears tough on the surface but I think it’s one of the untapped unclaimed funds sweet spots for the person who’s ready to dig in and make a living out of it. Oh yeah..and if memory serves Illinois has an incredibly long period before assets become “abandoned” and thus subject to finder fee laws and private detective laws. I think 7 years. Help me to make my friends and family help their friends and family make their friends and family a bizzilion people happy. Isn’t that what it’s really about. What to say to owners when you finally contact them is a big problem. Maybe you could include either a live call or a recorded call to such an owner. That would be a great learning tool. Also, if you could give us some creative ideas on what we can do with vacant land, such as cell towers, billboards, etc. that would greatly expand our minds as to additional profitable uses such land could be used for. OK, we’ll go over talking to owners – that seems to be a big one. We MAY be able to line up some live calls but it’s tricky because I don’t think it’s legal to broadcast people without their permission. I recently got your deed grabber course and am going through it now. You mentioned in a previous reply ” I’m seeing wisely bought and spruced-up $10-$15,000 houses in my area renting for $600-$800 per month (though taxes can be devastatingly high and make some deals no good even if they were close to free! )” It didn’t occur to me that taxes might keep you out of some deals. Will you do a case study during the marathon that would cover a good vs. bad deal with respect to taxes? I want to make sure I’m properly accounting for all expenses when analyzing a prospective deal. Also, have you ever noticed any “seasonality” to any of the deals you’ve done over the years? For example more and/or better deals found during certain time of the week, certain period of the month, certain time during a quarter, or time of year? I’m also interested in knowing if a title company (or some other professional) might be able to help in identifying the most likely candidates to give up their properties prior to a tax sale based on historical records of similar transactions? Sure, I’ll do a case study on that, with some deals right here in Lake County, IN. I’ve never noticed that deals happen more at times of week, month, etc. They happen when the tax sale deadline comes, whenever that happens to be! What is the fee for getting started as a student? How long does it take to learn the process? Are there any monthly follow up fees once you sign up? How can I win the TV. Suggest the best thing for us to cover or do on the Marathon and win the TV. It doesn’t take long to learn the process, you can get my ebook at http://www.deedgrabber.com/order.html, most people can read it an digest it in a day or two and get started. There are no follow up fees. I think the first thing you should do. is first include a call that can get people to step out on faith to stop the fear and procasination about RE Investing and stop them from dreaming and just wighing about it. so like a motivation cqll or something beyond that…? clear. Please tell me what am I suppose to say? Thank you for your online material. I would like to be one of your students. 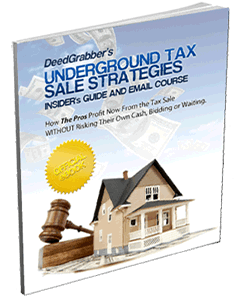 I am interested in tax sale unclaimed funds but I don’t know how to get started. What would you suggest?